I’m so far behind on my posting that Aiden is closing in on 8 months old. I’m doing my best to catch up….so here it goes! 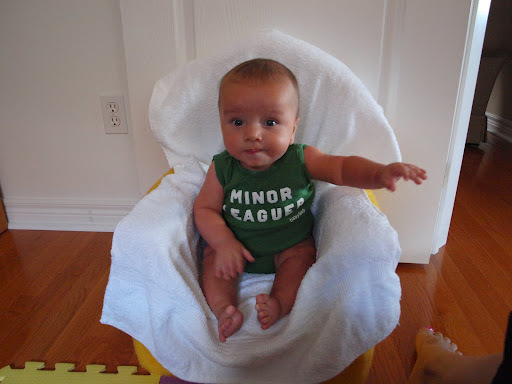 Aiden – you’re six months old! weight: close to 20 lbs….not the little shrimp any more! eating: still taking 6 oz every 3-4 hours (even at night..sigh!) You don’t like to miss a meal! You’ve started on baby foods and you love everything except green beans. When I gave you the first bite of baby food, you looked at me like it was the best thing you’d ever tasted in your entire life. development: you’re really coming into your personality and still so sweet and laid back. You’ve started sitting up pretty well and seem to enjoy being able to look around and observe everyone. You’ve decided the pacifier isn’t so bad after all so you seem to need that and your soft blanket at bedtime and naptime. You love to be in the exersaucer or swing. I think we’re in the beginning stages of teething because you’re really drooling and chewing on everything. We learned…the hard way….that you’re allergic to feathers. Just like with everything else, you took that in stride. You’re a good car rider and did exceptionally well on the long drive to Canada. You adore your big brother and he can make you smile and laugh better than anyone else! We love our sweet Aiden and are enjoying watching you grow! I’m throwing in the towel for the night but stay tuned for more pictures from our trip to Canada plus pictures from Myrtle Beach and here at home. There are quite a few more posts I’ve got in the works!